With an extra low cut hemless edge, Pringle Marian Shoe Liners are designed not to be seen, and to create a low bulk, high comfort protective barrier for your feet. 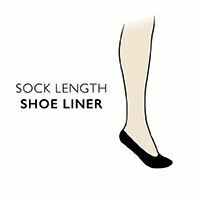 These fine woven liners skirt the line between socks and stocking in density, so they should feel comfortable in even close fitting court shoes, but you may need something finer for peep toes. Pringle Marian Shoe Liners are stocking-style polyamide rather than cotton, and come as a triple pack. They are made with anti-slip grips on the heel inners to ensure that they don't slide underfoot during the day.